Trainspotting is one of the largest cultural icons of the 1990’s, a ferocious, unflinching and rambling account of heroin addicts in Edinburgh. 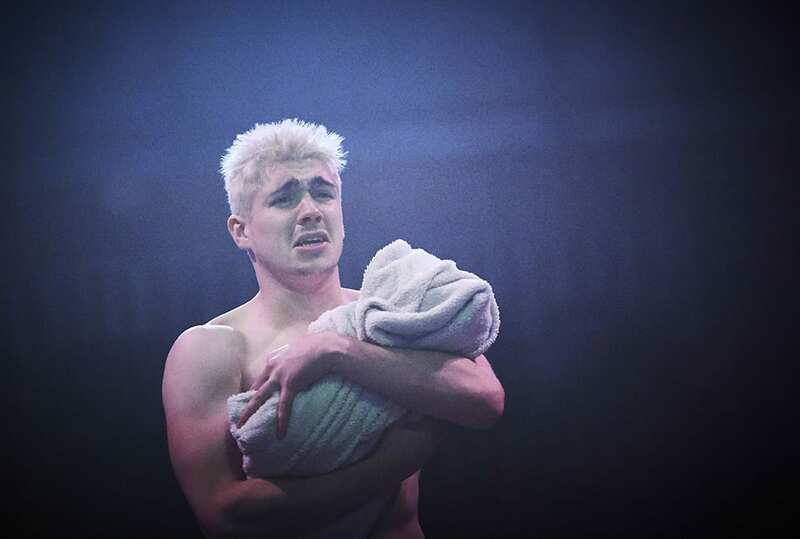 With a sequel to the film version being released soon, this fast-paced production, first staged in 2013, is a perfect reentry point to Irvine Welsh’s darkly humorous and deeply disturbing world. 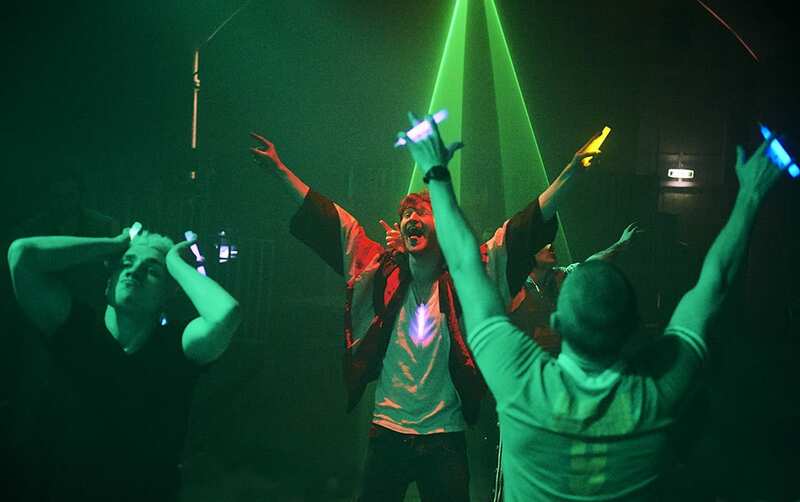 Entering to a rave sets the pace for this show. The tale is famously vague on its through narrative, more of a collection of events that could easily drag on if it weren’t for the quality of the anecdotes, and the production performs a flying leap over this hurdle by keeping every scene and line quick. Some plot points or jokes do get lost in this, and some characters have been cut (R.I.P. 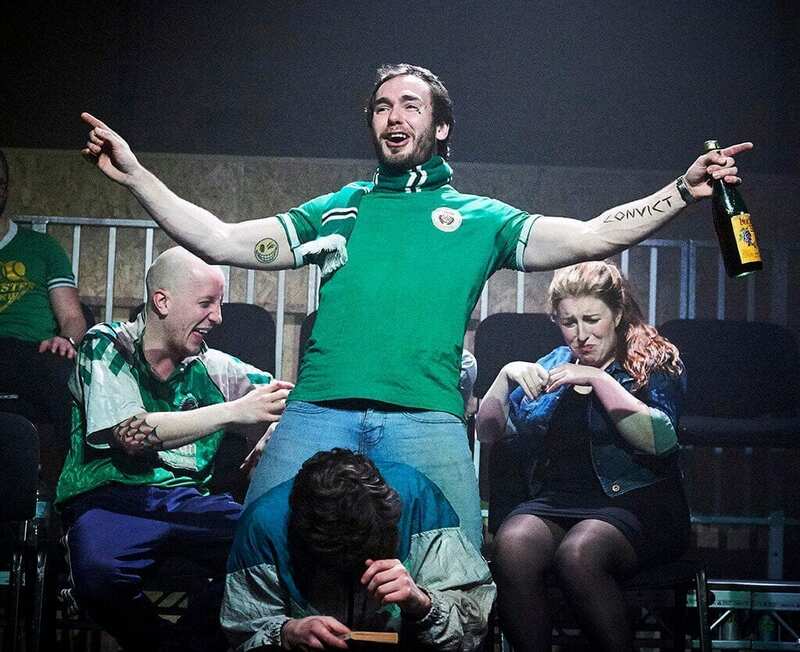 Spud) but it’s worth it, because the adrenaline wave this production injects into its actors and audience drags you almost immediately into their raw, raucous world. 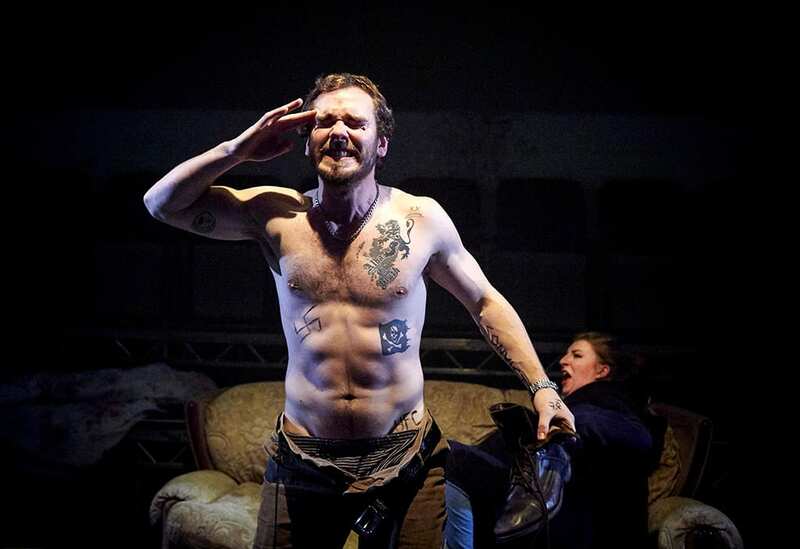 Gavin Ross is a strong Mark Renton, portraying his well-rounded hypocrisies, humour and philosophy with a bullish, wild-eyed and disgusting energy not usually associated with the character, but which serves his development well and makes him incredibly engaging. The entire cast keep the production slick, gross, funny and distressing in equal measure, relishing flinging various bodily fluids near or on the audience and singling out poor souls in the front rows for flirting, hugging and screaming. 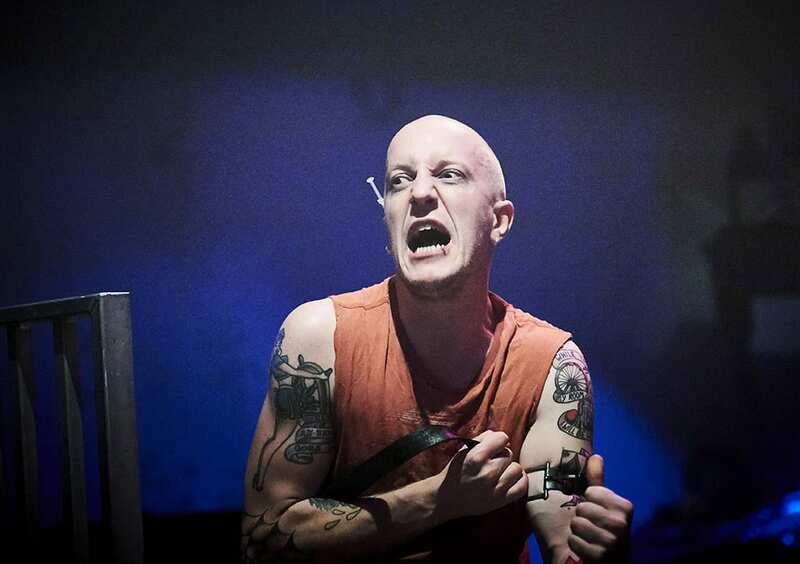 Classic In-Your-Face theatre, perfectly in sync with the world of Trainspotting, but it dies off in the more serious scenes, while I feel they could have had an extra impact by maintaining that commitment to audience interaction rather than toning it down to regular theatrical boundaries. There is a definite divide in this script of “fun” scenes and dark scenes, keeping most of them on either side of the halfway mark, making some plot points suddenly come out of nowhere and robbing them of a fair amount of punch. The only events that feel properly foreshadowed are Tommy’s corruption and Renton’s growth, and that’s because we spend far more time with them than any other character. Erin Marshall’s Alison is wonderful, but isn’t given much spotlight so her “big scene”, while gut-wrenching, is completely out of the blue. While the actors are strong as a whole, Begbie (Chris Dennis) could stand to have a touch of quiet menace added here and there, as his constant barrages of dialogue have little impact until he actually threatens someone, and Erin Marshall’s ensemble parts are muted compared to the rest of the gurning ensemble. Everyone pretty much nails their character however, and bring the book to live with eerie accuracy. Set design in the Vaults continues to be best served by allowing the brick caverns and good lighting to set the tone. Steel deck acting as seats for the audience and fluorescent strip lights tied to the sides of the bannisters recall a 90’s warehouse rave. A raggedy sofa and grim toilet, both nestled amongst the audience, are all that the actors have to play with. It emphasises both the nihilism of heroin addiction and actors’ interactions with the audience, removing any other distractions. Lighting and sound evoked sweaty clubs and stark scenes from cold squats with equal believability. I would say that this is an interactive show rather than the immersive experience it is touted as. The audience is seated while the actors hold them, threaten them, throw toilet water at them, but don’t invite us to play in their world. However, that’s a problem for marketing, not the production, and the show is an eclectic performance. If you can’t wait for T2, or enjoy bittersweet productions that can make you want to laugh, cry and vomit at the same time, this is the show for you.